Doing just some minor fixes today and checking some things in that I sort of forgot to check in yesterday. Making a first pass of the player being able to place these root nodes to program their navigation. Very simple progress gradient on the floor with some beacon geometry. When you transition modes to edit those, you will not see the beacon, but the actual controllable node graphics. 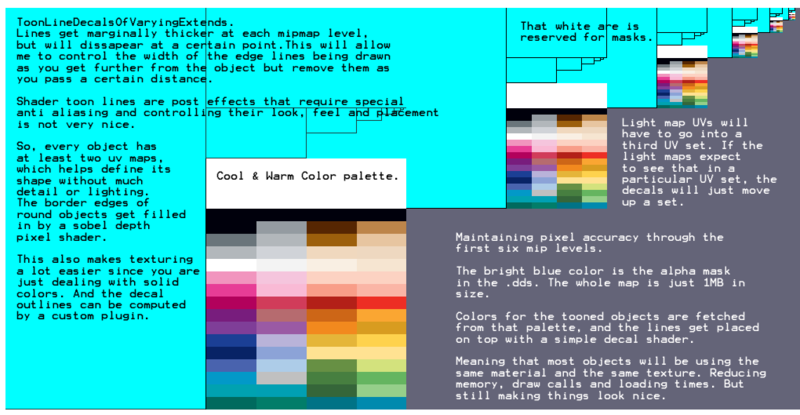 As for this color/decal texture that will be shared among the objects, you can see a short description of it here. Most objects just have solid colors. The variation in shade and noise will be contributed mostly by the light maps, ambient occlusion and shadows. There will of course be exceptions to this, such with sky boxes, effects, UI and some environment textures.